Happy birthday, Canada! In honour of Canada Day, wear your favorite red and white gear, face paint, and decorate your boat (streamers, balloons, etc. ), if you’re up for it! 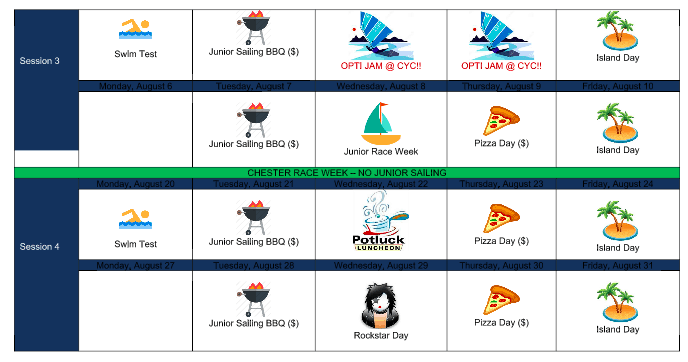 Every Tuesday, CYC Junior Sailing will host a BBQ on the premises, with hamburgers, hot dogs, various salads and treats! Who doesn’t love pizza?! Local and infamous Big Red’s will serve up cheesy, gooey, yummy pizzas for our junior sailors on the premises. Remember to put your order (cheese or pep) in at drop off (9 a.m.)! 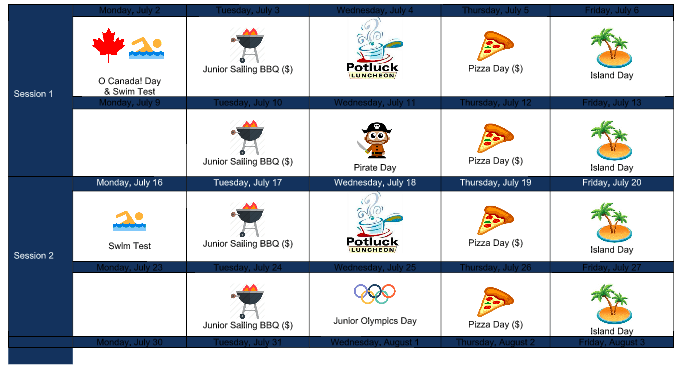 The second Wednesday of each session, we have a Junior Sailing potluck. All sailors are encouraged to bring their favorite dish to share with their fellow sailors. Favorites in the past have included homemade mac n’ cheese, Caesar salad, pasta salad, chicken wings and, of course, desserts. Please try to avoid food with nuts. YAAAARG MATEYS! We encourage sailors to dress as pirates of Mahone Bay, to enjoy a fun theme day celebrating pirates like Billy the Kid, Captain Jack Sparrow and Blackbeard! Our lessons will be pirate themed…we might even have a treasure hunt! Every Friday, pray to the Weather Gods and break out the Jimmy Buffet…it’s Island Day! After gearing up and loading the coach boats for a day away from the Clubhouse (water, sunscreen and lots of snacks), we head on an adventure sail to one of the nearby islands. Games will be played on the way and fun WILL be had! Each sailor is given a country to represent and is encouraged to dress up in their country’s colors. The day will include a mini regatta. After a fun day of racing and games, we head back to the Clubhouse for awards and a special snack from your instructors! Who is your favorite musician or singer? Come dressed up as them, maybe even bring a prop, and come prepared to belt out your favorite tunes (and dance moves) all day. All lessons are Rock Star themed on these days.